Chinese President Xi Jinping called for more innovation in the equipment manufacturing sector to accelerate China's drive toward becoming a manufacturing powerhouse and bolster the real economy. Xi, also general secretary of the Communist Party of China (CPC) Central Committee and chairman of the Central Military Commission, made the remarks during a two-day inspection tour in Xuzhou, eastern China's Jiangsu Province. Xuzhou Construction Machinery Group Co., Ltd. (XCMG), a leading homegrown manufacturer, was his first stop on Tuesday. 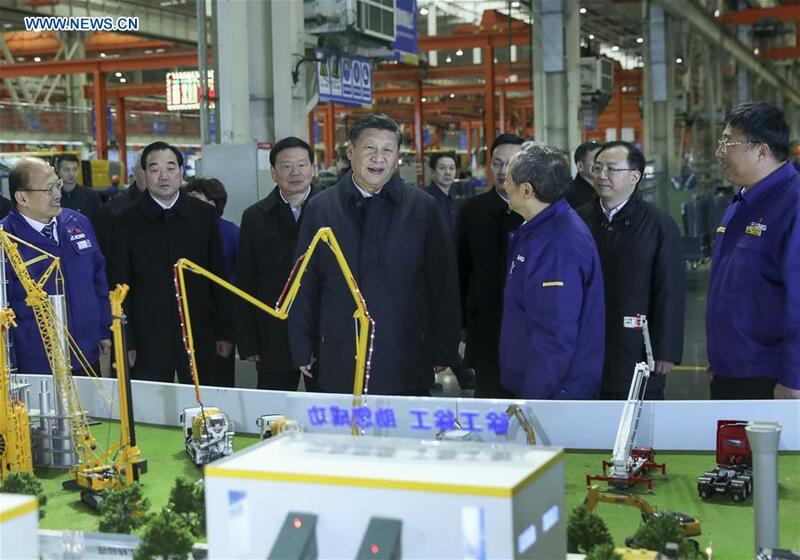 "Innovation is the source of business core competitiveness," Xi said after being briefed about XCMG's intelligent assembly lines and big data platform. Thanks to self-developed heavy-duty machines, XCMG is swiftly increasing its share in the global market. China should ramp up investment and channel more energy into research and development to spur the development of the equipment manufacturing sector, Xi said. "Many core technologies cannot be bought." Xi urged a shift from "Made in China" to "Created in China," stressing more emphasis on quality rather than speed, and encouraging homegrown manufacturers to build their own brands. Highlighting the role of state-owned enterprises, Xi said they should serve as a major force in the supply-side structural reform, aiming for international standards and leading domestic industries to move up global value chain. Founded in 1943, XCMG is the world's fifth largest construction machinery producer. Xi said he hopes the company will expand its technological advantage to grab a bigger market share and generate more social benefits. After leaving XCMG, Xi visited a wetland park which used to be a subsidence coal mining area. Ecological restoration has transformed the abandoned mine into a popular scenic area. Xi stressed economic restructuring in regions running out of natural resources and said the new concept of green development should be strictly followed. While inspecting Mazhuang Village near the wetland park, Xi encouraged Party members to play an active role in studying and implementing the spirit of the 19th CPC National Congress. Party organizations at grassroots levels should be strengthened to promote the Party's policies and decisions, lead the governance at the primary level, unite the masses and facilitate reform and development, said Xi. During the inspection, Xi bought a hand-made sachet from an elderly villager and asked officials to improve the transparency of village affairs and information services. Impressed by the villagers' clapper talk performance, Xi stressed the cultural-ethical development in rural areas. Promoting material wellbeing and raising cultural-ethical standards are both essential to the implementation of rural revitalization strategy, according to Xi. On Wednesday afternoon, Xi visited a memorial for martyrs and the Museum of the Huaihai Campaign (November 1948 - January 1949), which was among the decisive campaigns in the War of Liberation. The campaign showed that winning a war may not only depend on the weaponry or manpower, but also on troop strategy and tactics, confidence and courage, as well as the support and assistance from the people, which often serve as more important factors, said Xi. "By cherishing the memory of the revolutionary martyrs, we will carry on their unfinished work, emulate their spirit, remain true to our original aspirations and keep our mission firmly in mind," Xi noted. Xi also called on the armed forces to pass on the fine tradition and train revolutionary officers and soldiers of a new era with faith, ability, courage, and integrity, and see that the forces forever preserve their nature, purpose, and character as the forces of the people.